Remember when I took you on a walk around Park Slope? You might remember this very hot pink painted brownstone that just can't be ignored. Well guess what just hit the market? Yep, this sassy number is now available to the highest bidder. 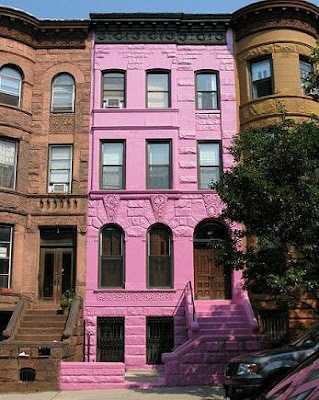 In case you were planning on buying any old brownstone and slapoing a coat of pepto bismol on it - forget it. These brownstones are protected by the Landmarks commission. You can't so much as paint your front door without verifying your choice is a historically appropriate color and getting their okay. In other words, if pink is your color, this is the only game in town. This one has been a bubblegum shade shade for decades - well before the landmarks commission had a say. In these parts, this house is not only hard to miss, its a controversial topic that elicits all sorts of opinions on house preservation, personal freedom and color theory. Very ironic to me is that the interior woodwork is unpainted. You'd think someone so liberal with a bold hue as this owner would be even more free on the inside. No matter, I'd love to have a crack at redoing this place. Its had the same owners for 60 years and is crying out for some fabulous refreshing, don't you think? Now don't get too excited and bid all at once, the price is as striking as the paint - a mere $2.5 million. Yowza! Maybe the Mary Kay company should be notifed about this building, too? I agree, the insides could use some TLC, espcially with such pretty woodwork. So disappointing to see the inside is so ugly, an exterior like that should be backed up with something wow on the inside...then at least there would be a point to painting a beautiful building like Barbie land!! Very nice woodwork indeed. Now, Mrs. L would you paint its woodwork or would you work with it if you could take a whack at it? With all that woodwork, what would you do for the kitchen? I would be interested in seeing what would you do. Wow... that is an awful color, growing up in suburbia one of the houses down the street from ours was painted a similar shocking flamingo pink color, which was strikingly out of place in Wyoming in January! I am quite surprised to see the interior. I think I though with such a bold cold on the outside the inside would be uber-modern or at least without 70's red carpet. Great potential though. littlealexa - I would definitely paint the woodwork. Its way too dark of a space to have all that dark stained wood for me. But that is sacreligious to some. No clue what the kitchen looks like so I dont have much to go on. Amy - This house is owned by a 90 year old man. So the interior doesn't surprise me at all. I LOVE the interior. 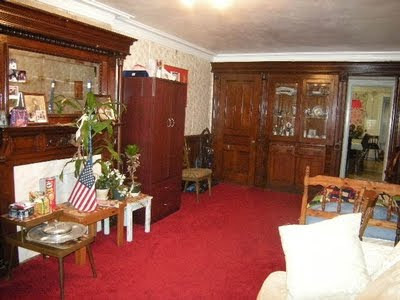 I can see past the 'old man decor' and appreciate that it's been left untouched. All those stunning original details are sadly slowly dissipating in these homes. I love that here they are still intact. I'm sure that it is exactly what going to attract the new owners to this home. 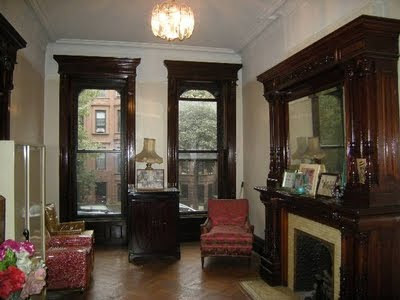 If I had $2.5 mill just laying around, I would definetly throw my hat in the ring for that brownstone. I don't even mind the pink. Not the mod interior I was thinking was going to pop up. Interesting. FYI: this house was painted this crazy color after the owner's wife died of breast cancer. it's meant to elicit a strong reaction so people will seek out the reasoning. there's a reason to jack up the price! Anon - I dont think that is accurate. Its been painted pink for longer than pink was known for breast cancer. Pink exterior paired with red carpet on the inside? Wow, yes...it needs your help. Perhaps you should offer your services to the future buyer! Love stories behind homes! I wonder what prompted the owners to paint the beautiful stone pink? Hmmm, I've gotta say...I don't think I like the color. Personal expression aside, history should be preserved in this case. Holy Cow! This would be a perfect pink for breast cancer awareness month. How fantastic! That takes some guts. Nothing like a pink brownstone to stop you in our tracks. I'll try to restrain myself on the bidding. Do you think their neighbors want to kick them in the shin? It looks more as if they had neighbors that they disliked and wanted to tweak their noses at them. It's been done before so that's my guess on it.  The brownstone is just screaming for your decorating touch Mrs. Limestone. Bernie Henry, a 90 year old man who said he first painted the Garfield Place house in 1968 (the district was deemed a historic district in 1973) upon his wife's wishes. Henry said, "When I went to get the paint, I thought it was the same [shade], but it came out a little different. But what could I do? I bought $4,000 worth of paint." There's also a very cute quote from neighbor David Alquist, who doesn't mind the unusual color: "One mom told her kid, 'No, you can't eat it.' I think the kid thought it was frosting." I love the outside and would love it more if I could redo the inside! Now if I had the $2+ million!!! This place has great bones but that color has to go. Man if I had an extra 2.5 mil I'd totally love to live in a pink house! Wow, that is pink! I miss Park Slope. I agree the inside and outside are incongruent but folks are like that sometimes too. It definitely needs your touches! I don't think I'd ever want to be that person that has to say, it's the pink one on the left, you can't miss it. Totally agreeing with Mango Gal above. And sighing from the West Coast. Wishing I was living in Brooklyn...so much more interesting. I'm not sure what happened inside but the outside is still pink. this house is so adorable .. on the outside. Im not really a fan of a really old fashion looks. I think this house would really sell if the owners went vintage !